I do like apocalyptic and post-apocalyptic movies. The bleak, depressing landscapes with gray tones. The survivors struggling against any threatening situation. In the past there have been enough movies that cover this subject: “Mad Max“, “The Day After“, the “Terminator” saga (in a certain way), “Waterworld“, “The Day after Tomorrow“, “I am legend“, “The book of Eli“, “The Divide“, “Dredd“, “Monsters“, “Oblivion” and even “Wall-E“. They’re all movies with earth as a ruined planet threatened by disaster, on which a group of survivors (or a single person) wander. 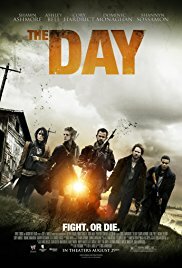 “The Day” had a brilliant start. The flashback in which we see how Adam loses his family after being kidnapped by … uh … someone. And then that gorgeous image of the five survivors armed primitively and dressed in rags, who continue their way in search of food and shelter. They are on the run … uh … for those others again and have two jars of seeds, which they want to plant somewhere. Beats me why this is important for them in this situation. This almost stylistically fragment with dark gray tones in a ruined and desolate landscape made ​​me curious and I was anxious to see the rest of the movie. The biggest downside throughout the film is that you’re wondering what exactly is going on. What has caused this and brought humanity in this situation? A nuclear attack? A global pandemic? An alien invasion? The sun partially blown away by a comet? You have no clue about it and you just sit there waiting for some explanation. That explanation shouldn’t be much. Just a few flashes purely as supporting information to get a better insight. You realize after a while that bloodthirsty mobs roam around in search for fresh human flesh. But are they mutated zombies? Or is the chemical contamination on earth so devastating that growing food is a problem and creates a food shortage? Or are those just aggressive survivors who have joined together in a kind of “clan”? It remains unclear until the end . So basically the whole story takes place primarily in that isolated house where they find shelter. Afterwards, this appears to be a trap, placed by those clans. We get some thrilling moments here. But also some irritating events occur here. The moment the alarm goes off, is the most exciting and nerve-racking in the entire movie. The secret that Mary carries with her and the moment it’s discovered is staggering. The reaction of Adam about this is terribly realistic and painfully portrayed. The siege and the eventually climax in the form of a bloody confrontation is no more than a duplicate of what we see in the better zombie movies. But nicely violently portrayed. The ending is surprising and shocking. A brief unpredictable moment. The elements that irritated me were : why couldn’t someone smash that alarm of the wall or blast it to pieces, they were really careful with the ammo but wasting five bullets for two trapped individuals in the basement, who couldn’t get out anyway, is kind of stupid, the miraculous healing of Mary her face after several devastating punches and blows that could break her nose. The five members weren’t acting that bad, but were rarely convincing. Especially Shannon (Shannyn Sossamon) was outrageously annoying, even though it is such a handsome appearance. The only two that played a significant role were Rick and Mary. The first really looked and felt as a leader and Mary had the instinct of a predator and did everything to survive. If it’s an apocalyptic movie, it is customary to ask Michael Eklund to appear in it. He has the perfect figure, facial features and expression for playing a kooky nuts character. Recently he also played a similar role as unstable person in a post-apocalyptic situation in “The Divide“. I thought “The Divide” was a bit better, more psychotic and traumatizing claustrophobic. “The Day” had a special mood, made ​​use of appropriate somber tones, but lacked that little bit extra to make it more impressive. And I hate it when I still don’t know at the end,what the hell it was about.